Actress Rinabeth Apostal already had experience performing Hosseini’s material; she originated the roles of Soraya and Mrs. Nguyen in productions of The Kite Runner. Here she offers an astounding portrayal of Laila, the middle class young woman whose life is nearly destroyed by the bombing of Kabul. She loses both her parents and presumably her secret lover Tariq and is forced to become the second wife of an abusive shoe seller, Rasheed, played by Haysam Kadri. Apostal enlivens every scene she is in with an unbridled energy and focus. We watch her go from a hopeful, romantic teen to a hardened and determined mother. Each note of her character arch rings true with a deep authenticity. Kadri has a tougher job playing Rasheed. The character is thoroughly evil from the earliest moments of the plot. The lack of depth in Hosseini’s character forces a somewhat one note performance, with little subtlety. Which is not to say Kadri does not succeed in being an incredibly effective bad guy. I was surprised the audience did not flat out boo him during his curtain call. Denmo Ibrahim reprises the role of Mariam after playing her at San Francisco’s A.C.T. She offers a tour de force taking on the multiplicity of characteristics of this tragic woman. Mariam is an illegitimate child who losses her mother at an early age. Her father forces her to marry Rasheed, a man thirty-nine years her elder. As he becomes more abusive she turns nearly catatonic. When Rasheed takes in Laila as a second wife, Mariam is initially jealous and resentful. After some time the two women bond and as Mariam shares her stories with Laila we see the spark of life she once possessed as a young country girl. Ibrahim does a remarkable job playing both the downtrodden wife as well as the hopeful young girl she once was. Later in the play, qualities of that younger girl emerge as Mariam is forced to find an inner strength to save Laila and her children from Rasheed and the oppressive Taliban that have garnered control of Kabul. The Rep has graced the production with an exceptional staging. Director Carey Perloff keeps the plot moving at a brisk pace, covering a great deal of the content of the original novel. Hovering over the action, scenic designer Ken MacDonald places a large sun seemingly made of barbwire. Not even the sun can provide solace in downtrodden Afghanistan. David Coulter has written an award winning score for the show and plays a variety of instruments including an electric saw to accent the stage’s action. Lighting designer Robert Wierzel is kept busy alternating stage effects delineating the many different scenes and settings. His work in Mariam’s final moments is particularly effective. The troupe should be very proud of the quality touches they have provided in the production of this difficult play. 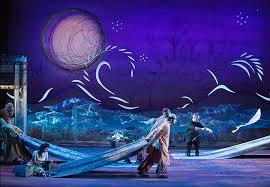 A Thousand Spelndid Suns plays through November 10 at the Seattle Repertory Theatre in the Seattle Center. For more ticket information go to www.seattlerep.org.